We’v seen some pretty amazing optical illusion drawings here on Mighty Optical Illusions. In fact, this articular hole drawing illusion has probably even been posted before as well. But, the hole illusion itself isn’t the focus of today’s post. The hole illusion on its own is definitely pretty cool, but how would you like to see it created? I absolutely adore watching artists work! Their talent and creativity never ceases to amaze me, especially when they’re able to create something so realistic and lifelike that it’s able to fool you. 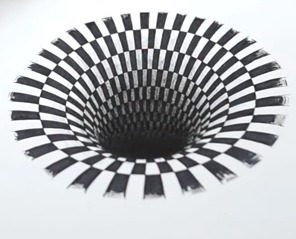 What did you think of this hole drawing illusion? If you liked this, you might also want to check out these 3D illusions that jump off the page! Prev Where Did Her Extra Hand Come From?